Where the Heck are My Glasses? I can hear my mother chuckling at herself after misplacing something, saying, “It’s hell getting old!” My mom was a very sharp 86 when she passed away, but she did occasionally give us gentle reminders us that she missed the energy, acuity, and multi-tasking abilities of her youth. This morning I had a moment. I’m visiting my sister, and we went out for dinner last night and had quite a few laughs. When we got back to her place, we stretched out on the couches and ate some Ben & Jerry’s ice cream (which neither of us should have), and watched a late movie. At some point, I got up, changed into my pajamas, turned off the lights and TV, put on my sleeping mask (there’s a full moon out there), and went to sleep. This morning, I got up, brushed my teeth, schlepped into the kitchen and made myself some coffee, sat down and reached for my glasses. Ummm… I reached for my glasses. On the table where I always leave them when I stay here. Because I really can’t function without them. Or without squinting so hard I get a headache. I carefully examined the table, the floor around it, the couches and chairs. I checked in the bathroom and kitchen, my duffle bag, and numerous other places. Bear in mind, without them on, I wasn’t really confident I’d see them, but I looked anyway. As soon as my sister came downstairs and joined me (she’d slipped upstairs during the night), she (with both contacts and glasses available), joined in the search. Which soon became a witch hunt. We retraced our steps, went through the trash, reached under all the chairs, and generally acted like people mildly deranged as we became increasingly frustrated. And in my case, panicky. We finally narrowed down a corner where they had to be, and actually moved the furniture. Voila! Somehow, my invaluable specs had fallen from the table and skated under the couch. Crisis averted. I’ll be able to see to drive home now. I won’t live the day with a headache. My sister is my hero. My precious glasses have been returned to me. This post was written in response to the Weekly Photo Challenge on WordPress.com’s Daily Post. This week’s challenge topic is Mine. To learn more about the challenge and to see the possessive images posted by other bloggers, click here. This entry was posted in Photo Challenges and tagged aging, Eyesight, Glasses, Health, Mine, photography, photos, postaday, postaweek, Senior Health. Bookmark the permalink. 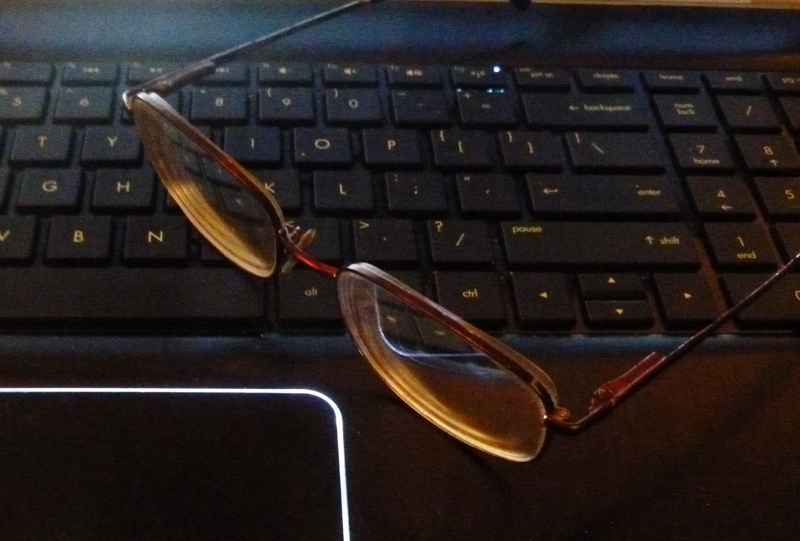 50 Responses to Where the Heck are My Glasses? Great post! Anyone who can’t see well without glasses can relate…very frustrating! I love it! Our mom was much the same – her sense of humor was the best! 😉 So glad you had that time recently – it’ll keep you smiling! I am the same way. One day they fell behind my bed. It was hard to find them then. I used to wear them on those string holders, but they (glasses) get broken. Once I put them on, I rarely take my glasses off ’til bedtime. I can navigate a little and use the Keurig coffeepot, but I have double vision and astigmatism, so that’s about my limit – Hence my possessiveness! At home I have another pair… but I have to get there! LOL! Love it. Completely sympathise. Last year I had it with the glasses search and bought 20 galsses at Primark at 2BPS/pair. now there are glasses in every room of the house in Vancouver and Oxford…so there! Wow – wish that would work for me! Unfortunately, I have too many things to correct! And I was going to write about the same thing. LOL Now you got ahead of me. I could feel your frustration. I’ve been through that so many times. This is something familiar. 😉 What was driving me crazy was the thought that I somehow hadn’t followed my regular routine, and couldn’t remember doing anything else! At least that wasn’t the case! Although, I confess, I have found the car keys in the refrigerator. On the spot. That´s me too…Lovely post and accurate writing! Glasses are a person’s most valuable and personal possession. Very apt to the theme ‘Mine’, loved your post. It happens all the time with me.